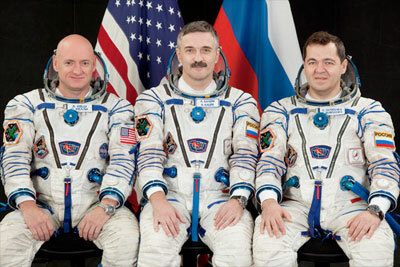 The Soyuz TMA-01M crew portrait is now on NASA's Human Spaceflight Gallery. JSC2010-E-124006 (August 2010) -- Attired in Russian Sokol launch and entry suits, NASA astronaut Scott Kelly (left), Expedition 25 flight engineer and Expedition 26 commander; along with cosmonauts Alexander Kaleri (center) and Oleg Skripochka, both Expedition 25/26 flight engineers, take a break from training in Star City to pose for a portrait. The Soyuz TMA-01M spacecraft and its booster were moved to the launch pad by railcar Oct. 5 for final preparations prior to launch Oct. 8 to the International Space Station. backup (Sergey Volkov, Oleg Kononenko and Ronald Garan). Soyuz TMA-19 launch is scheduled for Oct. 8, 03:10 Moscow time. The vehicle is due to dock to the ISS Poisk module on Oct. 10, at 04:05 MSK. The meeting of the State Board was traditionally attended by the young winners of Roscosmos’ patch contest 7-year-old Marina Korolenko of Murmansk region, and 13-year-old Sasha Turovsky of Tambov region, who's design will fly aboard the Soyuz-01M. Roscosmos cosmonauts Alexander Kaleri and Oleg Skripochka along with NASA astronaut Scott Kelly lifted off aboard Soyuz TMA-01M from the Baikonur Cosmodrome in Kazakhstan Thursday at 6:10 p.m. CDT (Friday, Kazakhstan time) beginning their two-day journey to the International Space Station (ISS). Less than ten minutes after launch, the spacecraft -- the first in a new line of Russian spacecraft upgraded with a digital telemetry system and digital flight computer -- reached orbit and its antennae and solar arrays were deployed. The trio will dock Soyuz TMA-01M to the station's Poisk mini-research module on Saturday at 7:02 p.m. CDT to join the Expedition 25 crew, starting their five-month tour of duty aboard the orbiting laboratory. Welcoming them aboard will be current ISS residents, Expedition 25 commander Doug Wheelock and flight engineers Fyodor Yurchikhin and Shannon Walker. Wheelock, Yurchikhin and Walker arrived June 17 aboard the Soyuz TMA-19 spacecraft. The six-person crew will usher in the second decade of continuous human presence onboard the station, continuing scientific research and maintenance activities, which began with the first crew arriving in November 2000. The TMA-01 crewmates will welcome multiple vehicles to the station during their months-long stay. In addition to Russia's Soyuz and Progress, JAXA's HTV and ESA's ATV, the trio will be aboard for the arrival of two of the last NASA space shuttle missions. The second of those missions, STS-134, which is targeted to arrive in late February 2011, will be commanded by Kelly's twin brother, Mark. The mission is currently planned as the last flight of the U.S. space shuttle program. Skripochka is scheduled to conduct three spacewalks, including one with Yurchikhin in mid-November to work on science experiments and hardware outside the station's Russian segment. Wheelock, Walker and Yurchikhin are scheduled to return to Earth on Nov. 29. Before departing, Wheelock will hand over command of the station to Kelly for Expedition 26, which will begin with the undocking of Soyuz TMA-19. Roscosmos' Dimitry Kondratyev, NASA's Cady Coleman and ESA's Paolo Nespoli will join Kelly, Kaleri and Skripochka in mid-December to complete the Expedition 26 crew. 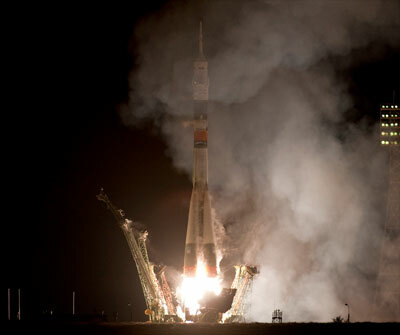 Chapman was sighted by the Associated Press at Baikonur Cosmodrome in Kazakhstan just before the 7:10 p.m. EDT (2310 GMT) launch of a new Soyuz TMA-01M spacecraft to ferry an American astronaut and two cosmonauts to the International Space Station. A photo released by the AP shows the red-haired Chapman, clad in red jacket and carrying a blue bag. AFP reports Chapman was at the launch as a guest of a financial bank. Russian media reports said she has been working as an advisor for a bank that is involved in the Russian space programme but officials at Russia's space agency Roskosmos were quick to deny it was involved in her visit. "Roskosmos has nothing to do with Anna Chapman's visit. As far as we know, she came here as a private individual on the invitation of an executive of a commercial bank," a Roskosmos official said. "Miss Chapman neither met with the Roskosmos leadership nor with members of the Soyuz crew," the official told the Interfax news agency. After a two-day journey, three new Expedition 25 crew members arrived at the International Space Station (ISS) and docked to the Poisk mini-research module at 7:01 p.m. CDT on Saturday. Flight engineers Scott Kelly, Alexander Kaleri and Oleg Skripochka will now begin a five-month stay aboard the orbiting laboratory. Expedition 25 commander Doug Wheelock and flight engineers Shannon Walker and Fyodor Yurchikhin have been aboard the station since June. They will greet their new crewmates at hatch opening about three hours after docking. The hatches between the Poisk module and Soyuz TMA-01M were opened at 10:09 p.m. CDT, after which the newly-doubled Expedition 25 crew spoke with officials and family members gathered in TsUP Mission Control located just outside Moscow. Among those who exchanged greetings were twin brothers, Scott Mark Kelly in space and Mark Scott Kelly on the ground, as well as Scott's younger daughter Samantha, who requested a special gift for her birthday. NASA TV will cover the March 16th return of three crew members who have called the International Space Station home for more than five months. NASA's Expedition 26 Commander Scott Kelly, Soyuz Commander Alexander Kaleri and Russian Flight Engineer Oleg Skripochka are scheduled to land the Soyuz TMA-01M spacecraft near the town of Arkalyk in northern Kazakhstan at 2:48 a.m. CDT (1:48 p.m. local time) on March 16. Kelly handed over command of the station to Russian cosmonaut Dmitry Kondratyev during a ceremony on March 14. The International Space Station's (ISS) 26th expedition has ended and three of its crew members are heading home. Soyuz commander Alexander Kaleri, station commander Scott Kelly and flight engineer Oleg Skripochka undocked the Soyuz TMA-01M spacecraft from the station's Poisk mini research module at 11:27 p.m. CDT Tuesday (March 16) as the two vehicles were traveling 218 miles over China. After backing away from the station and between two separation burns using the Soyuz's thrusters, the crew performed a test of their spacecraft's annmeters to monitor their roll rate. 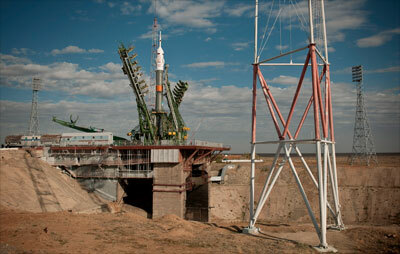 According to Mission Control in Moscow, the test was successful and the Soyuz performed as expected. Soyuz TMA-01M is set to land in northern Kazakhstan at 2:53 a.m. on Wednesday following a four minute, 17 second deorbit burn at 2:03 a.m. CDT. 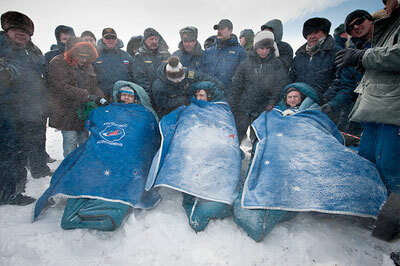 Soyuz TMA-01M and its three International Space Station Expedition 26 crew members are back on Earth after 159 days in space. Soyuz commander Alexander Kaleri, station commander Scott Kelly and flight engineer Oleg Skripochka landed in their Soyuz TMA-01M spacecraft at 2:54 a.m. CDT Wednesday, March 16 (1:54 p.m. local time) near Arkalyk, Kazakhstan. 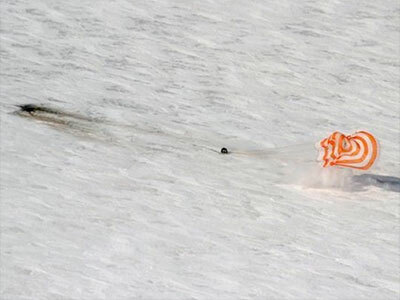 The first of Russia's "digital" Soyuz upgraded with modern navigation equipment, TMA-01M completed its maiden mission by landing safely on its side on the snow-covered steppe. First out of the spacecraft was Kaleri, who with this flight is now the second most experienced space traveler in history with 770 days in space over the course of his five missions. He is surpassed only by Sergei Krikalev, the head of the Gagarin Cosmonaut Training Center, who spent 803 days in space on his six flights. This was Skripochka's first space flight and Kelly's third, the latter having previously flown twice on the space shuttle. Kelly, whose twin brother Mark is set to command the next shuttle mission to launch to the station on April 19, has now logged 180 days in space. During their 157 days aboard the station, Kelly, Kaleri and Skripochka worked with their Expedition 25 and 26 crewmates on more than 150 experiments in human research; biology and biotechnology; physical and material sciences; technology development; and Earth and space sciences. 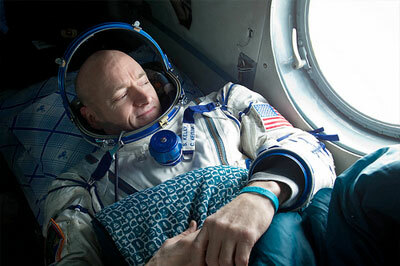 A quick succession of visiting vehicles arrived at the station during Expedition 26. The Japanese Kounotori2 H-II Transfer Vehicle 2; the Russian cargo ship Progress M-09M (41P); the European "Johannes Kepler" Automated Transfer Vehicle 2; and space shuttle Discovery delivered more than 11 tons of supplies necessary for working and living aboard the orbiting laboratory. 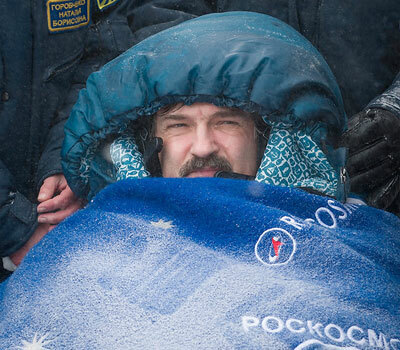 Working in the arctic conditions at the landing site, Russian recovery teams were on hand to help the cosmonauts and astronaut exit the Soyuz and adjust to gravity. Kaleri and Skripochka will return to the Gagarin Cosmonaut Training Center in Star City, outside of Moscow, while Kelly will fly directly home to Houston. The first landing photo (inflated canopy) seems to have been taken at touchdown, while the second photo seems to show the capsule being dragged downwind. 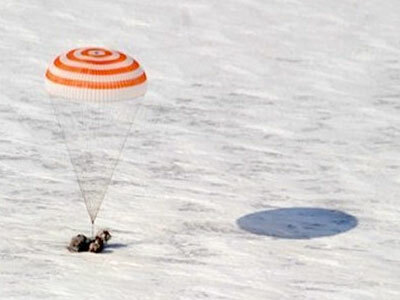 Is that what happens when a Soyuz lands - isn't there a way to cut the parachute lines? 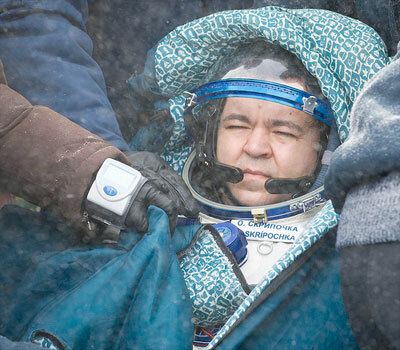 Indeed, according to NASA public affairs officer Rob Navias, who was on site at the landing, the main parachute dragged the Soyuz about 25 yards. The crew does have the ability to release the parachute risers (for example, in the case of a water landing) but nominally does not. Among other reasons, the red and white parachute serves as a location device for rescuers to locate the spacecraft. 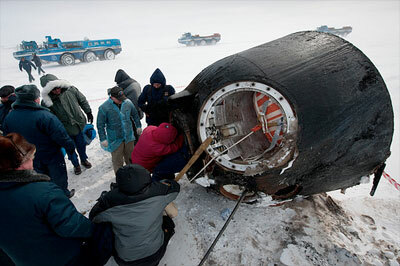 As a result, it is not uncommon for the Soyuz to be dragged onto its side, or along the ground for several meters. Soyuz TMA-01M commander Alexander Kaleri, ISS Expedition 26 commander Scott Kelly and flight engineer Oleg Skripochka were honored during post-landing festivities in Kazakhstan before making their return to Star City, Russia. Included is a post-landing interview with Kelly. When and why did it become standard procedure for NASA astronauts to be flown directly to Houston, Texas following an ISS expedition? Will this also apply to the ESA and JAXA astronauts? I certainly don't begrudge an early family reunion, but do recall that American crewmembers used to recuperate at Star City. Kelly's Houston homecoming was the fourth such "direct return" for U.S. operating segment (USOS) ISS crewmembers, which includes NASA, JAXA, CSA and ESA astronauts. The first direct return was in June 2010 by TJ Creamer and Soichi Noguchi. The second, in September 2010, brought back Tracy Caldwell Dyson. Doug Wheelock and Shannon Walker made the third direct trip to Houston in November 2010. The direct return allows for increased science to collected by bringing the crew members back to Johnson Space Center's human research facilities sooner, where they undergo more in depth medical exams than was possible in Star City. On April 12, President Medvedev awarded the title Hero of Russia and the Gold Star medal to cosmonauts Oleg Skripochka, Mikhail Korniyenko, and Alexander Skvortsov (first-time flyers on Soyuz TMA-01M and Soyuz TMA-18). So, no repeat of the Maxim Suraev drama this time. Alexander Kaleri (Soyuz TMA-01M) and Oleg Kotov (Soyuz TMA-17) received the Order for Services to the Fatherland, IV degree, and Scott Kelly (Soyuz TMA-01M) the new medal Merits in Space Exploration. Other cosmonauts (including Valentina Tereshkova, Alexei Leonov) and foreign astronauts flying on the Soyuz (like Dimitru Prunariu, Claudie Haignere) received honors as well. So, no repeat of the Maxim Suraev drama this time.